This little ice cream shop on Succotash Road is the perfect post-beach stop. Basically in my opinion any day is a “10” if it involves swimming and ice cream. Happily this weekend consisted of quite a lot of both. (Note: I’m not opposed to more than one ice cream in a day if there’s also more than one swim in a day). 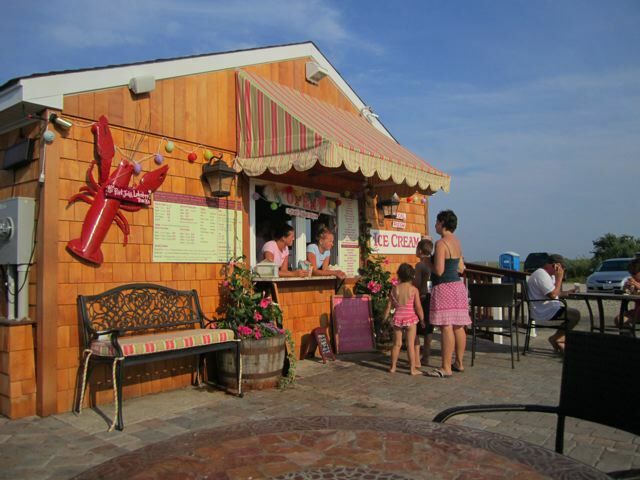 But the most pleasant surprise was the soft serve at the new ice cream shop at Lockwoods Marina where we stopped after a few hours at the East Matunuck State Beach in South Kingston. Of course, it’s hard to imagine a soft serve that tops Frosty Freez in Middletown, RI, and this one certainly doesn’t. Still most soft serve is simply terrible, tasting more like dyed ice than something deserving of the name ice cream. But the soft serve at this new little shop, located on Succotash Road next to Capt’n Jack’s, had a surprisingly creamy, smooth consistency with good flavor. If you’re not into soft serve, they also serve up homemade hard ice cream and yogurt, many with cryptic names like Mushy’s Monsta Mix and Mo’s Moose Tracks, but the cheerful staff can offer an explanation or even a taste. They also have a man-made fish pond outside over which the kids love to dangle their dripping cones. It’s the perfect treat, and if you’ve just come from a swim at the beach, you’ll have earned the calories. 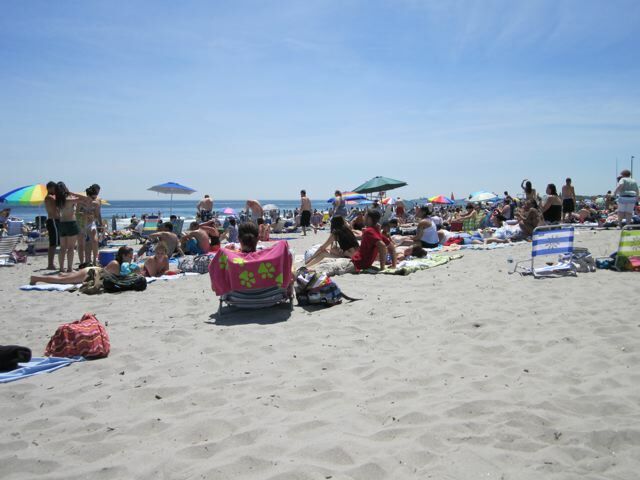 Scarborough State Beach drew crowds as early as Memorial Day this year. In 2010, the annual parking pass inclusive for all seven of the RI state beaches costs $30 for residents. Day rates for residents run $6-7/day. The walk into the water is a tad rocky and the sand isn’t as soft as some of the other state beaches, but it’s quite popular with families and is an easy walk to the beach from the parking lot. I guess this is technically a beach but it’s so tiny it doesn’t really feel like one. Most of Fort Adams State Park, which is gorgeous, dangles over rocky cliffs. You can also rent a boat from Sail Newport here. As for the beach part, there’s a small roped off area that has calm water for swimming. It’s definitely popular with families. Arguably, Westerly boasts some of the best beaches in the state. This one has over a half mile of coast. Hence, it’s one of the most popular and tends to fill up on nice weekends. This beach (known to locals as Sand Hill Cove Beach) has calmer waves due to the breakwaters that protect it from the open ocean. Not surprisingly, it’s more popular with families or anyone looking for a more relaxed ocean swim. You certainly won’t see any surfers here, although there are still a few eager boogie-boarders. On the same strip of land as Roger Wheeler, the Salty Brine is also protected by the breakwaters. The downsides: it’s a smaller beach than Roger Wheeler and is closer to the boats at Galilee (and thus any oil or other substances that might come with them). The upside: the town of Galilee is only a few steps away, which means a much tastier lunch or dinner than the typical greasy beach stand. This is a picture-perfect beach with soft sand across a wide beach and clear water. It definitely gets crowded and is quite popular with the youts (i.e. teenagers) so it’s a bit harder to keep track of kids especially when you nod off. On one visit, we heard three announcements for lost kids in a two-hour period. There is abundant parking at these beaches, so on a crowded day you’ll still find a spot in the auxiliary lot but it’s quite a hike. All Rhode Less Traveled posts are unsolicited and funded entirely by the authors.